Corporate bride on Wall Street. This decision paved the way for the obscene amounts of money that were spent in the 2010 and 2012 elections and emboldened groups like the American Legislative Exchange Council (ALEC) to write “model” laws for their elected minions to pass. 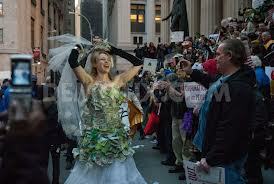 Happy peasants nationwide celebrated the third anniversary of corporate personhood on Friday, with the biggest celebration being a mass wedding on the steps of the New York Stock Exchange. With the Devil and hundreds of Occupiers as witnesses and Reverend Billy of the Church of Stop Shopping officiating, seven brides pledged their allegiance to seven corporate persons, and in turn, the corporate grooms promised to dominate and “own” them for the rest of their lives. 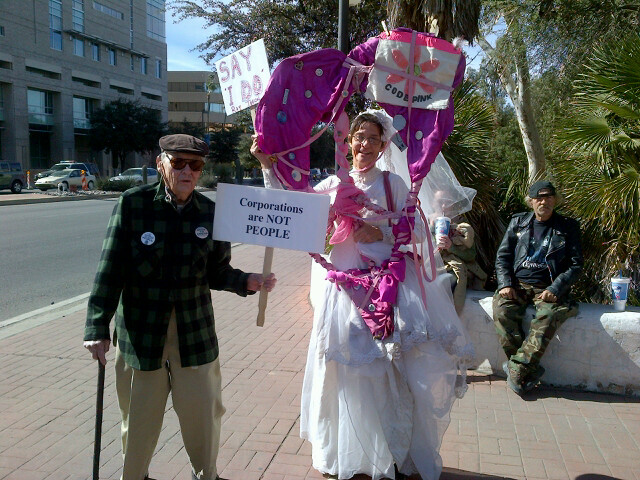 Occupy Tucson activist and bride Mary DeCamp looks for the perfect corporate person to marry. 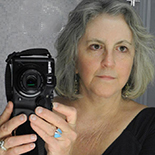 This entry was posted on January 20, 2013 by Pamela Powers Hannley in Arizona, campaign financing, Clean Elections, Congress, corporatists, Elections, Occupy, Tucson, Video and tagged Citizens United, Corporate personhood, Mary DeCamp, Occupy.